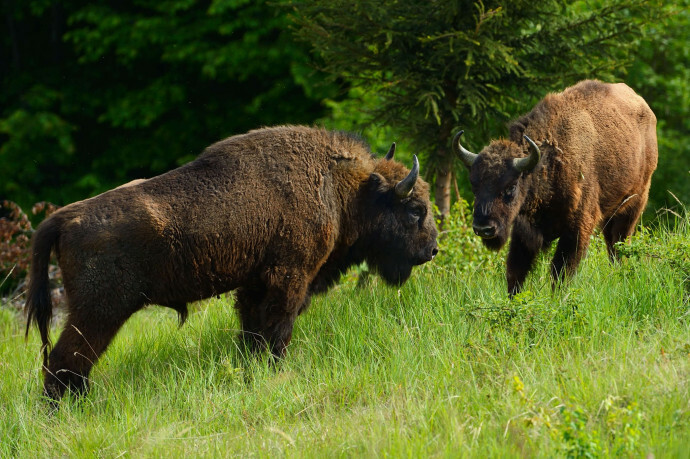 Rewilding Europe and WWF Romania are thrilled to announce the second release of European bison to take place in the Southern Carpathians rewilding area on 12 and 13 June 2015. The herd brought into the acclimatisation area last year will be released into the wild, becoming the first bison to roam freely in the Southern Carpathians for over 200 years. In addition, a new herd of 18 European bison, originating from six different wildlife centres in Europe will arrive in Romania to be brought into the acclimatization area. One year ago the European bison, Europe’s largest living wild land mammal, was first reintroduced into the Southern Carpathians, when 17 bison were brought to the Țarcu Mountains, originating from breeding centres and zoos all over Europe. Since then the herd stayed in the rewilding zone (160 ha) where it was given the opportunity to ‘rewild’ and to learn necessary survival skills for life in nature, and also to form a solid social herd structure. The herd successfully adapted to the area, is in good condition and is now ready for living in the wild. On 13 June they will become the first European bison to roam free in the Southern Carpathians for over 200 years. Once released, these bison will not be additionally fed or otherwise taken care of, so that they will become a full part of the natural ecosystem in the Tarcu Mountains Natura 2000 site. Rewilding Europe and WWF-Romania have set up this bison reintroduction into the Southern Carpathians with a specific approach: over the coming ten years we will regularly release a considerable number of bison, at several different pilot sites in Southern Carpathians. In this way we expect we can build a viable population of at least 300 animals by 2024 (including offspring), consisting of different herds roaming the area and connecting with each other. The bison event this year will take two days. On the first day, Friday 12 June, the new herd of 18 European bison, originating from six different wildlife centres in Switzerland, Germany, Belgium and France, will arrive in Romania and will be released in the acclimatization area. On Saturday 13 June, the bison herd that was brought to the area last year and has since adapted to the new climate, will be released into the wild by opening the fence of the rewilding zone. Rewilding Europe and WWF Romania are inviting all interested parties to attend this bison release, which will not only be a great local event but also a unique moment for conservation of the European bison. We invite you to be part of a flagship initiative that will help this charismatic species to get out of the danger zone, and making the value of wild nature and wilderness areas embraced by local communities. A short overview of the last year’s bison release. The location where the animals release is taking place is part of the vast and wild Tarcu Mountains Natura 2000 site, which is some 59 000 hectares in size. Once released into this area, the animals will graze with other herbivores. There are bears and wolves in the area, which in the future could potentially prey on the bison, which is part of the rewilding process and allowing for important ecological processes to take place. For this reason Rewilding Europe is also working to increase the numbers of other wildlife species, in particular red deer and roe deer. The European bison is a charismatic animal with a longstanding heritage in Romanian history and culture, loved by the general public. There are fewer bison in the wild than there are black rhinos, so there is a true urgency to bring back this symbolic animal into its old habitats, to play its ecological role again. In turn, this iconic wildlife species is a key species for rewilding and for preserving wilderness strongholds. To make this initiative a success, Rewilding Europe and WWF-Romania are working very closely with the local community in Armenis, authorities at local, regional and national level, local entrepreneurs, hunting associations and tour-operators. The release is part of the Bison Rewilding Plan 2014–2024, which was published by Rewilding Europe in November 2014. The bison reintroduction in the Southern Carpathians is made possible through the generous support of zoos and parks throughout Europe, for which we are very grateful. Parco Natura Viva (Verona, Italy) and the European Nature Trust (United Kingdom) are supporting the European bison reintroduction in the Tarcu Mountains in the Southern Carpathians rewilding area, by providing financial support to purchase GPS collars. The new bison that are being brought to the area come from several European countries: Germany (Springe, Kiele), Belgium (Han-sur-Lesse, Bellewaerde), Switzerland (Bern) and France (Thoiry, La-Haute-Touche, Le Breil sur Mérize). They have all donated their animals and contributed to export, veterinary and food costs. The Wildlife Park Han-sur-Lesse not only did that, but they also hosted two of the Rewilding Europe bison for over a year, covered all hosting costs and provided funds for a round-up transport. The Dutch Postcode Lottery, Dioraphte Foundation, Toyota Fund for Europe and The European Nature Trust make this amazing bison reintroduction in the Southern Carpathians possible as the prime funding partners.